Following last year’s double header against the Evergreens, when two LX Club teams won at Chelmer Park, this game was a complete reversal. It was disappointing that only eight players arrived for the fixture, also that the team was without a goalkeeper, suggesting it would be a very tough game in the Essex sunshine. ‘Evergreens’ very kindly lent the team Jim Morris, who played very well as an extra defender, but the lack of a goalie meant that fullbacks, Rainer Vogt and Arthur Barber, who both had magnificent games, were always outnumbered. It was not long before Chelmsford’s Welsh wizard Ralph Thomas was weaving through the defence, eventually getting a hat-trick, and the team was 4-0 down at half time. This was despite the skilful efforts of Austyn Leaverland and Norman Ballard in midfield; without them the score would have been in double figures. After the invigorating half-time port and/or whisky, LX Club managed several good attacks, and with Norman Ballard sweeping a pass to David Read, unusually playing as a forward, who released the ball to David Simms who poached a goal past Fred Matthews to score and give LX Club some hope. This inspired the team, and Tony Williams on the right wing made several good runs into the opposing circle, following passes well set up by the buccaneering Gurney White. However legs began to tire, and Chelmsford regrouped towards the end, finishing up as well deserved 7-1 winners. 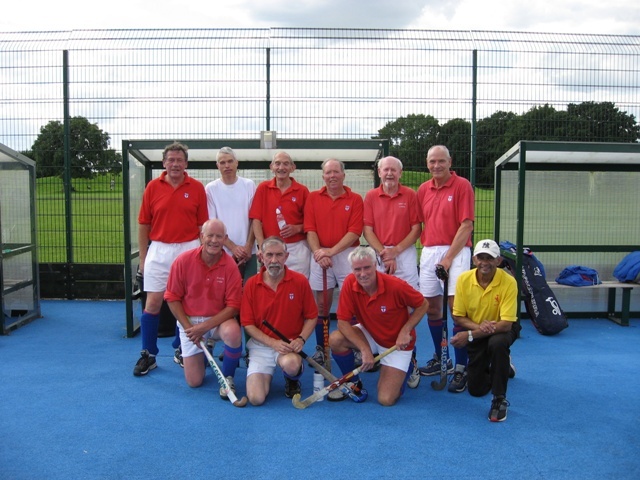 Team: Jim Morris (Evergreens), Rainer Vogt, Arthur Barber, Gurney White, Austyn Leaverland, Tony Williams, Norman Ballard, David Read, David Simms (Captain). Many thanks go to David Simms, the LX Club Manager, who organised the fixture in lovely weather, umpires John Gordon and Ross Thompson for their management of the game, and Evergreens for their excellent after-match hospitality.